Provide comfort for the family of Trientje "Trini" King with a meaningful gesture of sympathy. 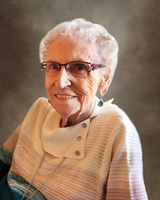 Trientje “Trini” Elizabeth King (née Van de Wetering) passed away peacefully in her 96th year with her family at her side on February 9th, 2019 at the Hanover Care Centre in Hanover. Beloved mother to Wayne King (Judy) of Kincardine. Dear grandmother to Steven King (Anne) of Victoria, BC and Heather King (Gene) of Trail, BC. Loved sister to Hennie of Halifax, NS and special auntie to Dianne Wilkes and girls of Midland, ON. Predeceased by her husband Charles W. King. Trini was born in 1924 in the Netherlands and spent her later teen years in a country under German occupation. She met Charlie, a Canadian solider and they were married in January 1946. Later that year she made her way to Canada, her new country, on a ship with many other war brides. Trini and Charlie lived in Toronto until 1967 when they moved to Brampton where she resided until 2018. She worked in Toronto and Brampton as a bookkeeper and loved to sew, knit and play tennis. She was very fond of classical music. Trini constantly wanted to learn new things and was quite comfortable with her computer and iPad. She was very closer to her grandchildren and kept in constant touch with phone, email and Facetime. She will be missed by all. We would like to send a special thank you to the Hanover Care Centre for all of their love and support. A private family service will take place. Memorial donations to the Canadian Cancer Society or Heart and Stroke Foundation would be appreciated as expressions of sympathy. To send flowers in memory of Trientje "Trini" Elizabeth King (Van de Wetering), please visit our Heartfelt Sympathies Store. We encourage you to share your most beloved memories of Trientje "Trini" here, so that the family and other loved ones can always see it. You can upload cherished photographs, or share your favorite stories, and can even comment on those shared by others. Provide comfort for the family of Trientje "Trini" Elizabeth King (Van de Wetering) by sending flowers. Sending our sincere sympathy, Wayne and Judy, and family. From our childhood in Holland to bringing up our families in Canada, so many memories, I will miss my only sister. Wayne, Judy, and family, Thinking of you all and sending deepest sympathy. Love, Roy and Bonnie.